There are three possibilities with this hat. First, it might have been a gift to the Haida people who put their designs on there, including the Raven…The second is that a Raven didn’t pay a debt, so they put him on top…And the third is that a grandchild can use a grandfather’s regalia, but I only saw that once in my life. 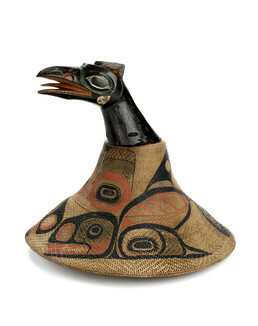 This woven spruce-root crest hat is topped with the head of Raven, yet the design painted on the crown is the Killer Whale, a crest belonging to the Eagle moiety. The combination of symbols from opposing moieties on a single hat is rare. It might represent trade with the Haida, where this combination is allowed, or mockery of an unpaid Raven debt to social opposites. Even more rarely a child may be given permission to use a crest of his grandfather’s clan, always of the opposite moiety, creating a mix of designs. Donald Gregory: It’s a killer whale design on the hat, but the top piece is a raven head. Delores Churchill: It has Chilkat [written] right on here. Donald Gregory: Looks like they sewed it. Clarence Jackson: Delores the weave on it, tell us about it. Where does the weave start? . . . It’s hard to explain if it was made by a Haida or a Tlingit. Delores Churchill: Let’s see where the beginning is right here. No it’s going—it’s Tlingit. It’s going clockwise. Clarence Jackson: Okay I was thinking that it was a gift maybe but it can’t be. Lingitch aya uwa.ak ya s’aaxw yu awe akaneek. Keet aya ka gooch. Yeil. Yaa t’aa kwas ch’a goot at aya tsu yeil awe. Uwayix haa wooxeex. Daasa ya ax guxsatee? Deikinaa s’aaxwux sateeyin yeilx aya guxsatee. Keet deikinaa aayi. Uhaanch kwas ch’aak’ aya, yaat’aa kwas deisheetaan aya. Yeil akinaat teen. Waasawe ee toowuch? Deix akinaa yei yatee, yeil ka ch’aak’. George Ramos: Deikinaach [Haida] . . .
Clarence Jackson: Lingitch aya uwa.ak. Deikinaa aayi ku kuxdak’ool’in awe yoo aknaneek. Lingit aya ku.a gaaw yaakandaxeedi yax awe du akx. Yoo awe aklaneek. Clarence Jackson: Ch’aakw kaa yinaade at kawdushaayi aya. Kaachxanaak’wx xaa yoo lingit yahaayi aa kawduwach’akw. Kooteeyaa kinaa. Kaayinaade at kawdus.haayi awe. Has du nahees’adi tlel has awusgei yoo ku.oo. Yoo awe. Ach awe kooteeya kinaa yei has wuduwa.oo. Gwal ach awe. Delores Churchill: I wonder if they got it in war from the Haida because of the raven. Donald Gregory: You know, it could be that the hat was made and given as a gift and a Haida put the design on it. Clarence Jackson: That is entirely possible but that’s why I asked her if it was a Haida weave or a Tlingit weave. She said it’s a Tlingit weave. Donald Gregory: Well maybe a Tlingit made the hat but a Haida put the design on it. . . . If we look at this one again, the thing I was looking also on this design makes me think it’s Haida because it switches again in the form. It goes to a red thick form-line on the ovoid. So that’s why I’m guessing that it’s probably a Haida design on there. . . . On this raven head too, you see on the paint there’s those markings like on the Haida like the gashes. But you never see that in the Tlingit where they separate you know filling in that solid space. And you could even see it on the beak here but it’s fading away. Rosita Worl: Then we might have had a proxy. Clarence Jackson: Gwal kaa jeet wuduwateeyi s’aaxw ahe. Gwal de weidu at yaax’ kaa jeet wuduwatee. Shakw dei. Gwal has du jeet wuduteeyin ya s’aaxw tlel ku aya has awuneegwal’. Tle kaa jee kux has awatee. Delores Churchill: But Rosita, that’s very possible because the Haida used to pick their canoes up. They have a picture in Yakutat with the Haidas bringing their canoes, because they didn’t have that big of trees. So the Haidas brought their canoes to trade, they brought the new ones in the back. So they possibly could have just exchanged hats too, because this design is really puzzling. That’s why I dragged Clarence over there before we even started, because I know that Tlingits don’t have the killer whale with the raven but the Haidas do. Clarence Jackson: But the Haidas do. . . . What I said a while ago, perhaps they gave that hat without a design, it was a gift. And they put that design on later, the raven, and it was a gift it back again, maybe to another clan or maybe to the same people. So maybe it was gifted twice. Aron Crowell: So originally a Tlingit woven hat, going to a Haida, who then may have decorated it, and then it came back to Chilkat some way. Clarence Jackson: That’s one way. Another way we talked about it, was that if Raven owed to the Killer Whale and didn’t pay and then the Killer Whale hat a right to put the raven up there. But it’s a very unusual case. Delores Churchill: It happened very rarely. Clarence Jackson: Only once I saw it in Wrangell, still there. One clan didn’t pay, they carved it on a pole because of their debt. Rosita Worl: But this also demonstrates the same problem that we have in museum collections, that you will have multiethnic artists involved, but the way I understand it is that very often they would commission. You could commission a good artist to do something which would account for a Haida design on a Tlingit hat. Rosita Worl: Or it could be a grandchild, like you know how you let your grandchild. Clarence Jackson: . . . The grandchild can use a grandfather’s gear, regalia but I only saw it once in my life. My grandmother’s brother always danced for maybe fifty years in his father’s Chilkat blanket and headpiece, and I didn’t know it. Finally I found out that all our stuff burned up, and we didn’t have anything, and so the fathers let my grandmother’s brother use the raven Chilkat blanket. He danced in it. So I asked my great grandfather how come this took place. He said ‘Children on occasions can do that.‘ He said, ‘Because he’s our child.‘ That’s a brand new revelation for me, because I understood a lot of things black and white, there’s no gray areas in what I understood about things like that. Eventually they both died, and it reverted totally back to the Kaach.adi [Raven Clan]. The blanket is still in Kake. Yei awe ax daa kushusigei aade ee een kaxanik ye. Shankookweidix awe sitee ax dachxan. Ch’a yeisu atk’atsk’u awe. At wuwaadi kwas ax naa.adi tlel waasa uti toot awul’eixi. Shankookweidi awe xat ku.a Tsaagweidi aya. Ch’aak’x haa sitee. Tle ch’as tleix’ daheen aya xwasiteen ch’aak’ du eesh has naa.adi toot awul’eixi. Tle keijin jinkaat taakw x’aanax awe atoot awal’eix.